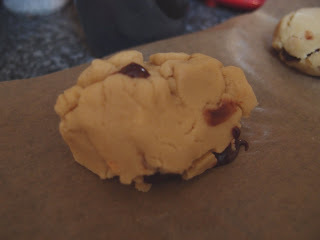 Continuing my love for all baked things using peanut butter, I present to you a work of art – a peanut butter cookie filled with an oozy ganache filling. Oh boy, does this work! 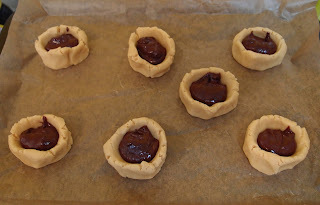 Somewhat perversely, having amassed a collection of biscuit cutters that can only be contained in 12 drawers of storage (small drawers – it’s not like I’m obsessed or anything), I find myself currently favouring biscuit recipes where cutters aren’t required. They are often quicker and easier to make. 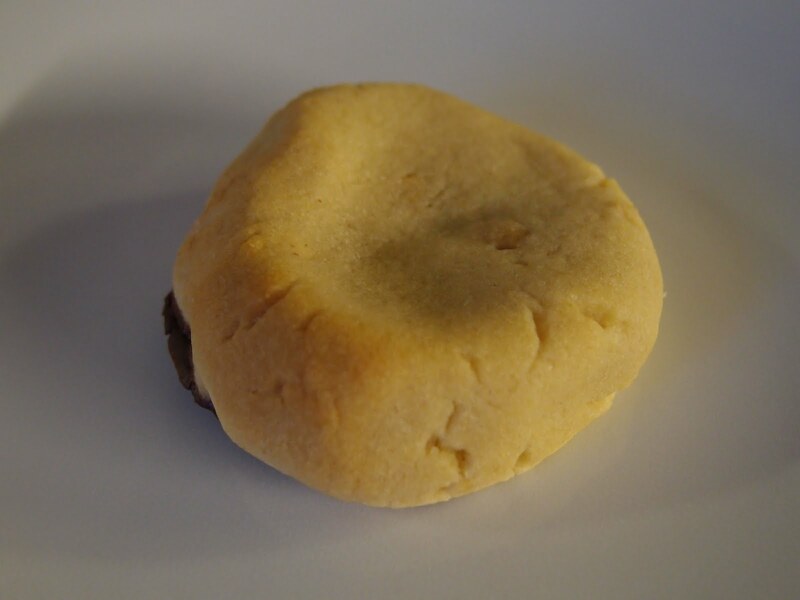 The salty peanut butter in the biscuit works so well with the thick ganache – a flavour sensation! CCB: Do they come in large batches, nothing more disappointing than an epic biscuit that only comes in 24’s ? Start by making the ganache, as you want this to have time to cool naturally before adding to the biscuits. Best not to refrigerate it as it can set hard, I found placing it by an open window helped. If you’re pushed for time give it a short burst in the fridge. I think my ganache was possibly still too runny so give it time to firm up. 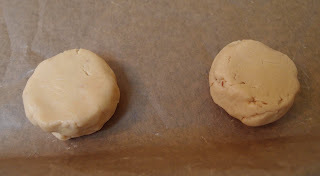 Now make the biscuits: Line two baking sheets with baking paper. In a large bowl, beat together the butter and sugar until it is light, whipped and fluffy. Beat in the peanut butter, followed by the golden syrup and milk. 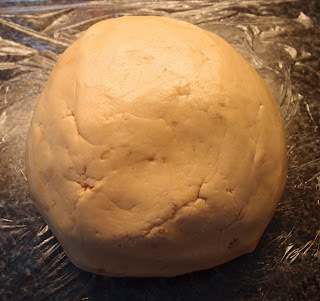 Add the flour and bicarbonate of soda and knead until you have a smooth dough. Take a generous tablespoon of dough and flatten it into a patty. 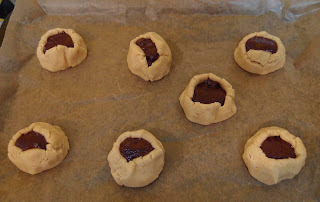 Place a teaspoon of the now firm ganache into the centre of the patty and then pull up the sides so you can seal them i.e. leaving you with a ball of biscuit filled with ganache. If the ganache isn’t completely sealed in it can leak during baking. 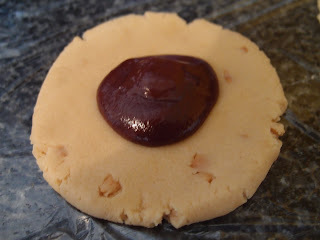 I found this didn’t always work and it was easier to make an indent (with the end of a wooden spoon) into a ball of dough and then spoon the ganache in before pinching it closed – but you will get less ganache in using this method. Place the ball on the baking sheet and flatten slightly. Repeat with the remaining mixture. Bake for 10-12 minutes or until the biscuits are golden brown. Leave to cool completely, still on the baking sheet, on a wire rack. Store in an airtight container for several days and eat as and when required. As a fellow lover of peanut butter, most especially when paired with chocolate, these look divine. Will certainly be making them asap! Ha ha great post, I'm a peanut butter lover too! Oooh, they look really good. And I've got plenty of peanut butter hanging around waiting to be used up. 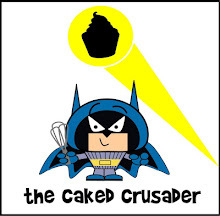 Perhaps I'll have to make these sooner rather than later! wow these look gorgeous and I don't even like peanut butter! I reckon eating those would be seriously addictive. I could likely eat 10 in a row ! Try refrigerating your ganache overnight as you would for truffles. It will firm up. You can then use a melon baller or teaspoon and it should stay where you want it. HTH. Oh wow, they look amazing, such a great combination! Oh yes. Chocolate filled biscuit with added peanut butter! I love peanut butter and chocolate! 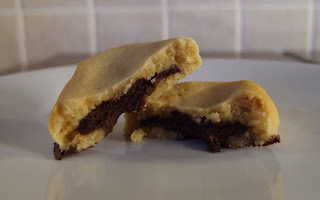 I've made something similar - peanut butter cups with nutella but these look amazing. I like the rustic look :) Must try it out! so worth all the hastle to get them right. was there enough for your brother? - they look so good that I'm thinking 36 wasn't enough!!! I bloody love peanut butter, what an amazing recipe, I must make it!!!! I am just back from a week of over eating in France so will have to hold off making them for a while! Problem is that I tend to eat my peanut butter straight from the jar with a spoon so never have any! Oh goodness these look good. I'm not a fan of too much faffing about, but these look as though they'd be well worth it. Peanut butter and chocolate is just yum! And were there enough for tea? These sound delish - I would be very happy with the rustic variety. Wooow I've never seen anything like this before! What a great idea. Yum!! Made these for the office... I was getting orders afterwards. So good people are willing to PAY for it. 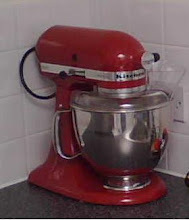 Very fiddly and time consuming though, just as well I love to bake!